A year ago, in one of my YouTube videos, I asked subscribers to comment on bodies of water in Pennsylvania that they’d like to see me fly fish. One body of water that was mentioned several times was the Brodhead Creek, which is located in Monroe County, Pennsylvania. The Brodhead isn’t far from the Poconos and is a 22-mile long creek that splits Stroudsburg and East Stroudsburg before dumping into the Delaware River. Last week I decided I’d finally fly fish the Brodhead. I had plenty of time to research the stream and found out that it has an interesting background. One of the more interesting points is that some fly fishermen regard the Brodhead as the birthplace of modern fly fishing. Apparently there were quite a few well known authors and even Presidents of the United States that once wet a fly line on the Brodhead. Once the Catskills gained a good reputation, they supposedly went north. The Brodhead has also dealt with land rights throughout the years. Much of the Brodhead used to be bordered by private property, and had quite a few private fishing clubs, including some that are still active today. As a result of the hard work of local officials, the Brodhead now has a lot of public park lands around it, making it a great place to explore for trout. The Pennsylvania Fish & Boat Commission stocks the creek heavily. Although the commission no longer publishes stocking numbers, I can remember when they did, and the numbers that went into the Brodhead were considerably more than other Pennsylvania streams. The high volume of stocking has led to a good population of holdover trout and there is even a thriving population of wild trout. The view on the Brodhead Creek where I started fly fishing on Saturday. The forecast for Saturday wasn’t great; it was supposed to be very cold with snow expected in the afternoon. However, there was no chance of wind and I knew cold weather would keep people off the water. I got on the road early on Saturday morning and didn’t see much daylight until I arrived in Stroudsburg. I pulled into the Creekview Park lot around 7:30am. It was frigid out. I planned accordingly, wearing my long underwear and bringing a couple of boxes of hand warmers. After getting bundled up and rigging my 9’-5wt Scott fly rod, I tied on one of my infamous J:Son Rubber Legged Hare’s Ear Nymphs and dropped my Green Dot Squirmy pattern off the hook bend. I headed down to the water to start my day. I stopped and took the water temperature and it was 42°. I’ve found over the past few years of cold weather fishing that the trout tend to move to deeper water as the temperatures drop. So rather than focus on the riffles, I worked my way to the tailouts that had good water depth. The first pool I came to was fairly wide and a good 3 feet deep in the middle. The first rainbow trout I caught on the Brodhead. 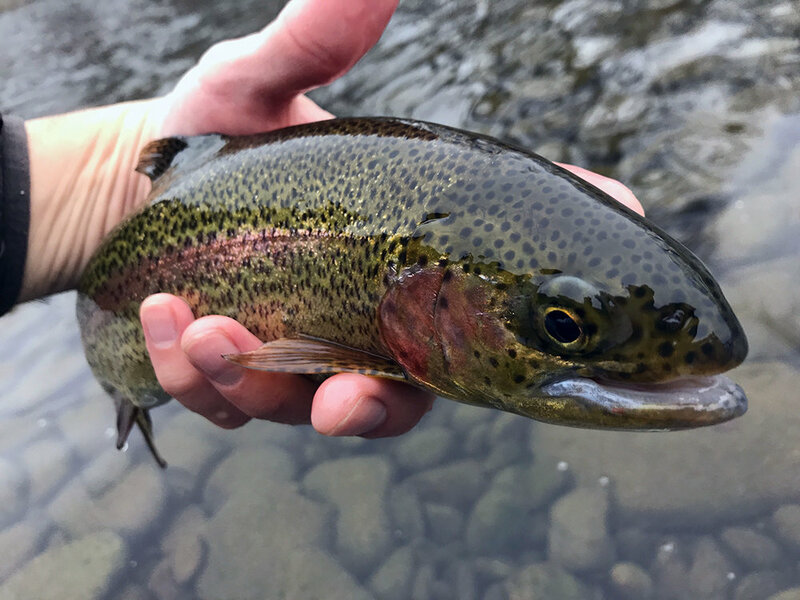 On my third cast, I hooked up with my first Brodhead rainbow trout. He took the squirmy and was a feisty fish that looked healthy. A couple of casts later I hooked up with another fish, again, another rainbow. I knew the state had done a fall stocking back on October 17th and I figured these fish were part of that stocking. I began working my way downstream fishing any water that looked like it’d hold fish. In the first three hundred yards of water, I hooked up with quite a few fish. I knew this was going to be a good day of fishing. About mid-morning, the snow started to fall. The scene on the Brodhead Creek was incredible. 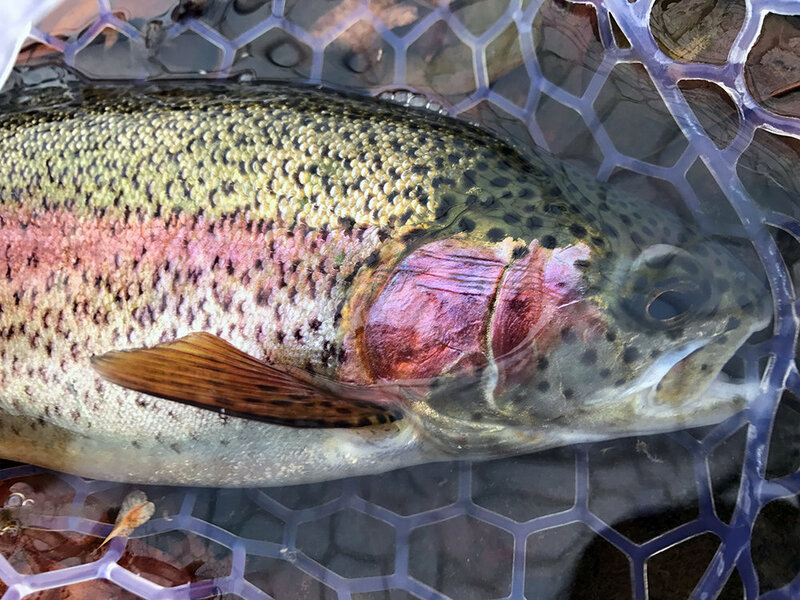 It was quiet, there wasn’t another soul on the water, and the rainbows were hungry. On my walk downstream I walked by several abandoned homeless camps made up of old tents. I didn’t encounter anyone, but it was sad to think that some folks were living out their life in a tent in the freezing cold. Where the Main Street Bridge crosses the Brodhead. By the time lunchtime rolled around I’d caught over a dozen fish and I’d worked my way to within sight of the Main Street Bridge. My original goal was to wade to the confluence with McMichael Creek, however, by the time I got to Main Street, I was exhausted and didn’t want to extend my walk back. I walked the Levee Loop Trail back to Creekview Park. The snow was falling in giant flakes and as I walked through the woods on the far side of the park, I spooked two whitetail deer that were bedded down next to the trail. When I got back to where I’d started I walked upstream a couple of hundred yards. I caught a few more rainbows and then hooked into what I believe was a wild brown trout. With a few inches of snow at my feet, I decided to call it quits around 2:30pm so that I didn’t have to deal with slippery roads in the dark. As I walked back to my truck, I appreciated the white landscape and considered the possibility that this may have been the birthplace of fly fishing. 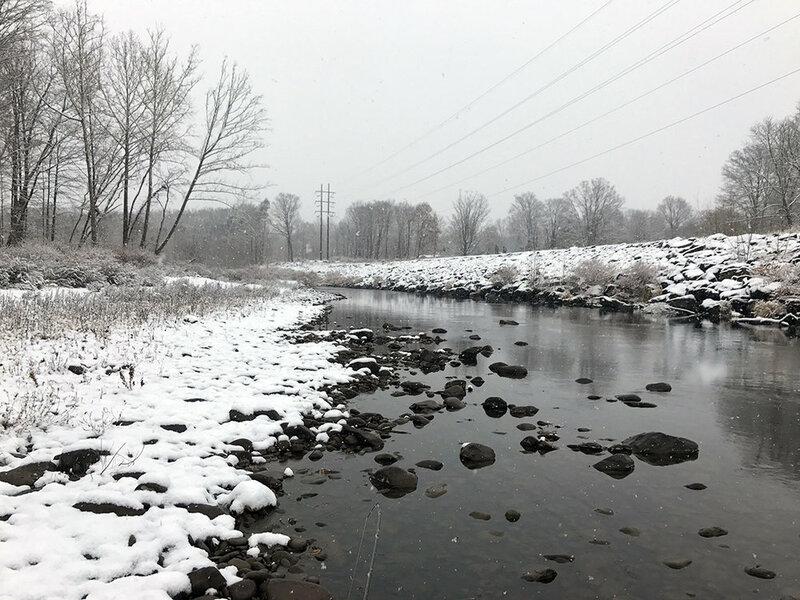 The Brodhead Creek covered in the season's first snow.